The Arado Ar 79 was a German aircraft of the 1930s, designed as an aerobatic two-seat trainer and touring aircraft. 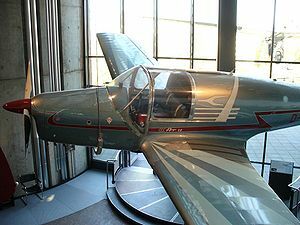 The Ar 79 was a monoplane with retractable, tailwheel undercarriage. The wings were fabric over plywood, and the forward fuselage was fabric over steel tube, and the rear fuselage was monocoque structure. On 29 July the 2,000 km (1,242.8 mi) at 227.029 km/h (141.069 mph). From 29 to 31 December, a modified Ar 79, with a jettisonable 106 L (28 US gal) fuel tank and extra 520 L (140 US gal) tank behind the cabin, completed a non-stop 6,303 km (3,917 mi) flight from Benghazi, Libya to Gaya, India, at an average speed of 160 km/h (100 mph). From Donald, David, ed., The Complete Encyclopedia of World Aircraft, New York: Barnes & Noble Books, 1997, ISBN 0-7607-0592-5, p. 60.